Emily Zhang’s kitchen exudes sophistication and class. The eye-catching kitchen with clean lines is the focal point of the home on Lancing Road in Sandringham. The simple and classic style flows seamlessly throughout the house, from the moment one steps through the door. The kitchen is contemporary and combines high functionality with sleek surfaces for the ultimate modern feel. The design features a chunky island that is all white – Jag Kitchens Glossy white acrylic for the cabinetry and a similar coloured white stone benchtop. 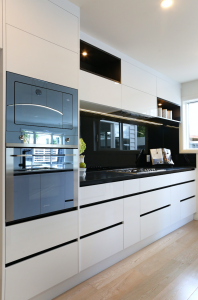 The cabinetry at the back is the same glossy white but has a benchtop in black engineered stone. This is complemented by some open cabinets in a dark timber colour and a shimmery black glass splashback. The sink and the handles, which are all black, tie both areas together perfectly. The monochromatic colour scheme is nicely balanced by the warmer tones of the white and timber bar stools and light wooden floors. A stainless steel stovetop and fridge bring life to the space, while still maintaining the minimalist modern atmosphere. Step into the walk-in pantry and you’ll be pleasantly overwhelmed by the feel of space and the openness of the area which features a window, bench and yet more storage. The home is spacious and inviting, creating a luxurious feel combined with comfort. 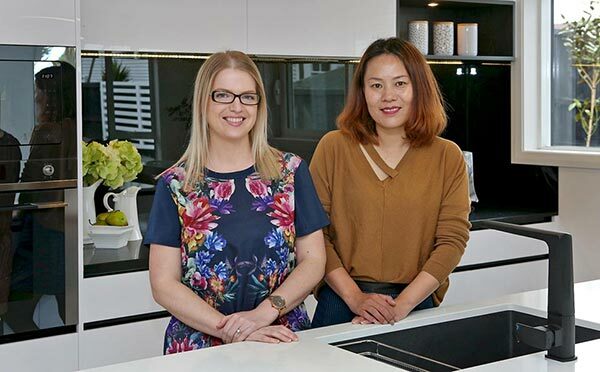 Emily has nothing but praise for the team at Jag Kitchens in Botany, who she says were “true professionals” and simply exceptional to deal with. 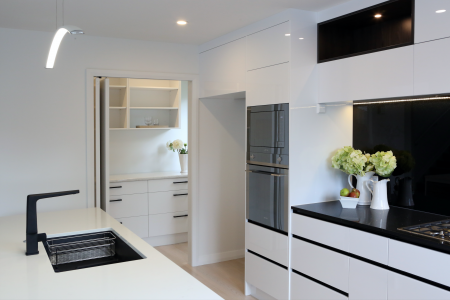 She says she approached a range of kitchen companies when looking to build her home and settled on Jag Kitchens because of their easy approachability and reasonable pricing. She has never looked back. “Everything was quick and easy and they offer fantastic customer service,” she says. Jag Kitchens’ design consultant Hannah Brown explains the kitchen was designed with the purpose of reselling the home and so the ‘wow’ factor was crucial in order to draw in buyers. The kitchen has given the most important space in the home an amazing feel. “The black handles and black sink, the accent cupboards above the cooking area and the island seating area, pulls it all together,” she says about the future forward kitchen. The effortless and uncomplicated design, Hannah believes, has enough character to capture the attention of potential buyers. “It is also simple enough to allow them to envision how they can bring their own unique style to the space.” Storage was a key part of Emily’s dream kitchen requirement and Jag delivered it. Jag Kitchens has an excellent reputation for designing and building for all budgets and for providing an outstanding and fast design service with sound advice. Their professional design quotes are free of charge.